A magical experience not to be missed. 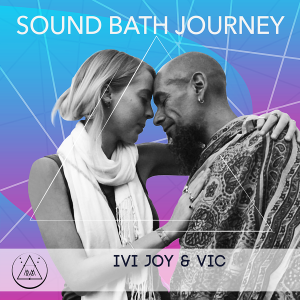 Sound bath is a practice that allows us to be bathed in sonic vibrations that are emitted with the intention to reestablish harmony within and around a person or group. It isn’t about rhythm or music, it is harmonious, transcendental, and delicately potent, creating cosmic sounds that are familiar to the soul. Ivanna was born in Japan, grew up with Mexican nationality, recently became a US citizen, and is a world traveler. She has 14 years of experience in the communication and entertainment industry. 11 years as a reiki practitioner, and almost two years now walking and sharing the healing and enlightening path of Nada yoga, the yoga of sound vibration. She believes that we all have the power and all the resources to heal ourselves. In her own words “Being spiritual is a lifestyle where we are awake and aware of who we are and what we are here for, and our self-experience is our greatest teacher”. ViC Founder of the movement to rename our planet Love in order to raise its vibration, and of CitiZEN Yoga in Miami. Student of Akhilanka at Temple of Singing Bowls in Mysore, India. Sharing nada yoga, shamanic work, vibrational healing and spirituality in private and public sessions and retreats around the world.